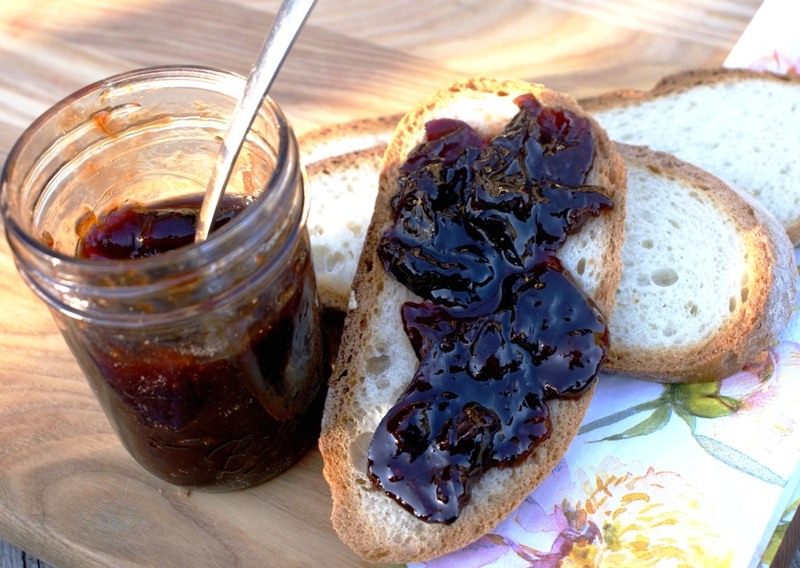 This is an easy-to-make jam with only three ingredients and no additives. I call it Grandma-Style Jam. 🙂 It reminds me of my childhood and the warm days of late summer when I helped my grandmother can all the veggies and fruit of the harvest. 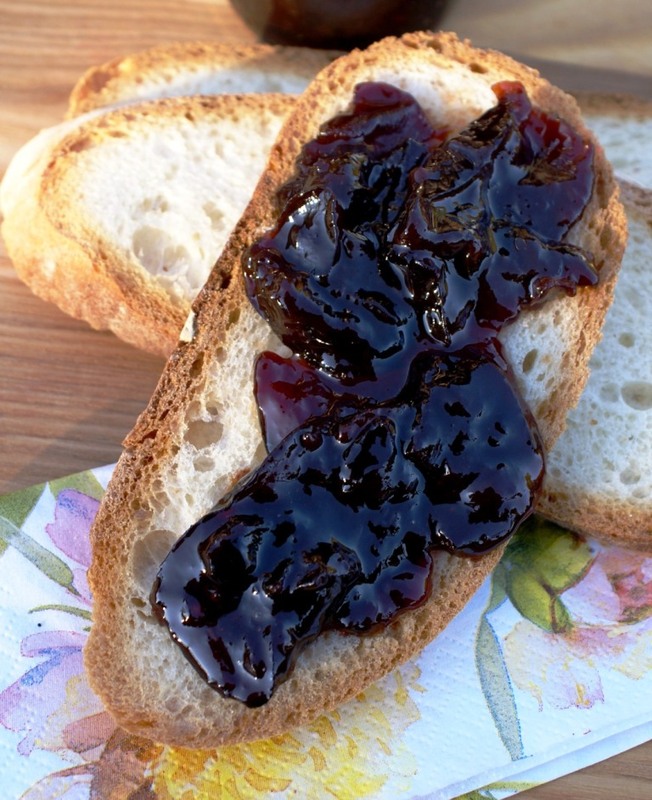 This old fashioned jam is made with Stanley Plums, those oval, pretty, deep bluish-purple ones. Jam takes some time to bake, but there is no artificial ingredients and the jam keeps very very well for a year and without refrigeration. I’ve used this jam for breakfast with bread and butter, with pancakes and waffles, in crumble/coffee cakes, sweet yeasted buns or buchteln. I am sure you will find a way to use this fragrant, sweet tasting goodness! 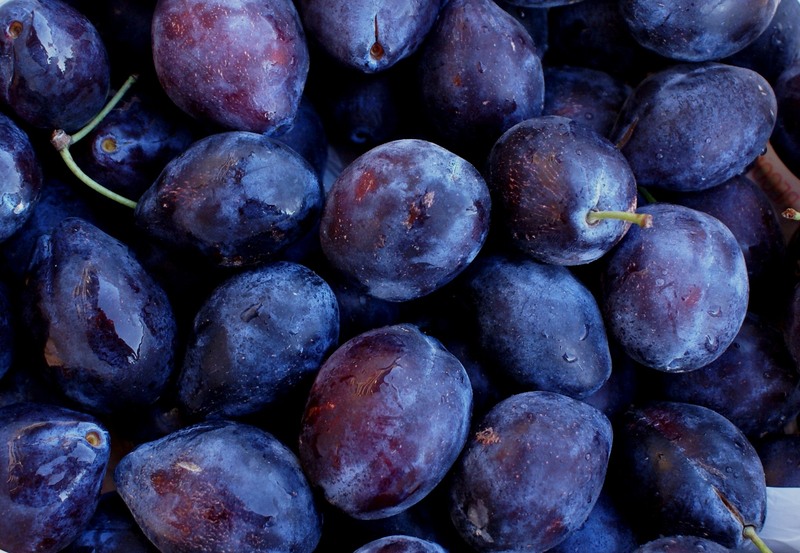 Wash your plums thoroughly (I wash them three times), place on kitchen towel and dry lightly, pit them and half them. All fruit need to be absolutely healthy, discard any that have rotten parts. Preheat your oven to 200 C (400 F). 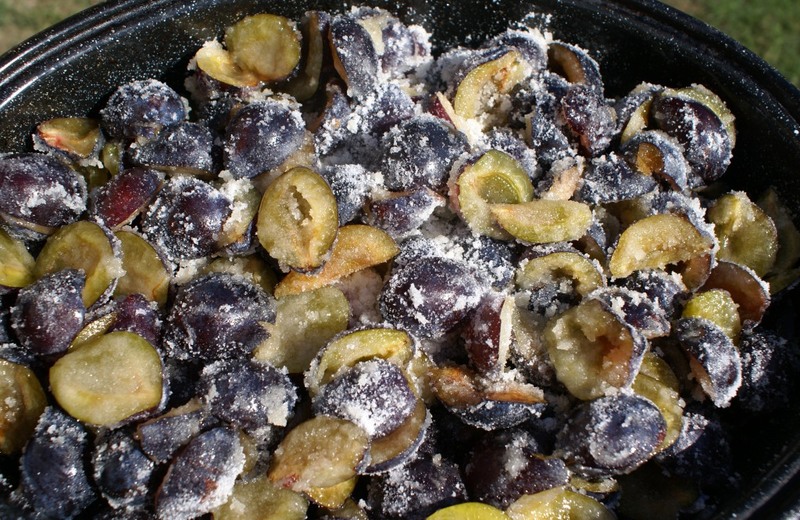 Place the plums into a deep roasting pan. Do not over fill because jam maybe be boiling over and messing up your oven. Pour sugar over plums and stir until well incorporated. Place the lid on the pan and put in the middle of the oven. Keep the lid for the first 30 minutes of baking. 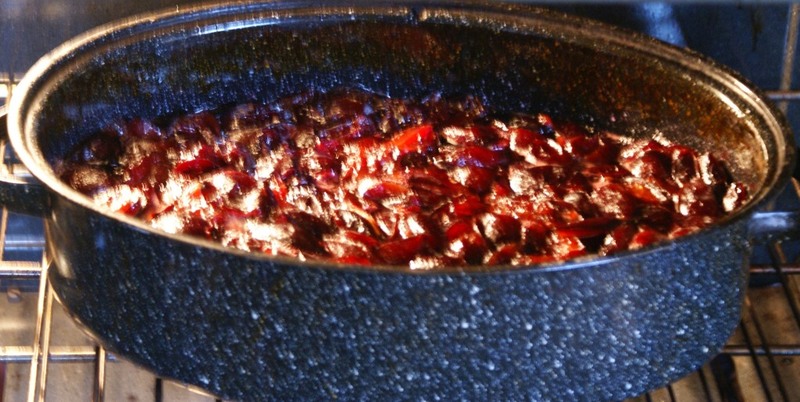 After the first 30 minutes, take off the lid and stir the plums. Bake for another 2 – 2 ½ hours, stirring every 30 minutes. When you notice jam is thickening, add rum and bake for another 10 minutes. Fill into clean, sterilized and hot jars and follow your usual canning procedure. Looks delicious. Sounds easy. Beautiful images – as always. Thanks Darryl! Very easy indeed and sooo delicious! Only three ingredients and one of them is rum! This idea is definitely a winner, Sibella. Oh, Sibella, this looks incredible! 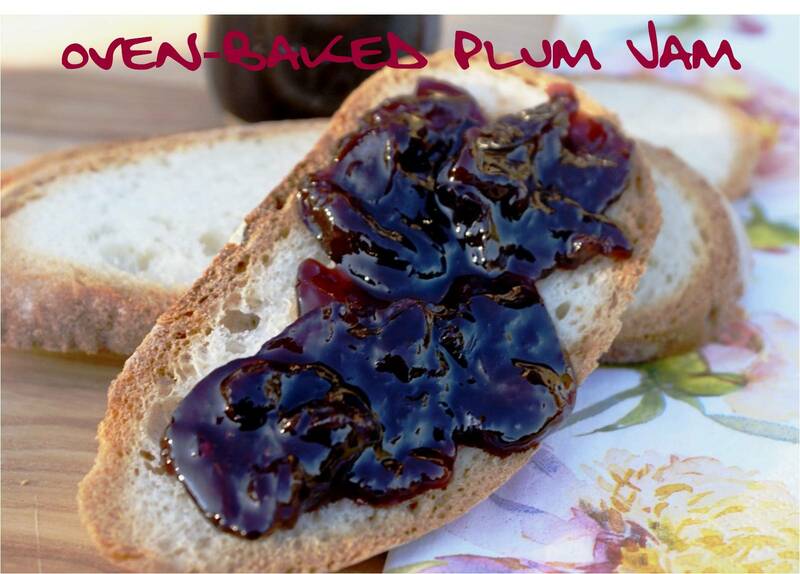 I never heard of using the oven for jam;I just love the idea …and the ingredients! Wonderful!